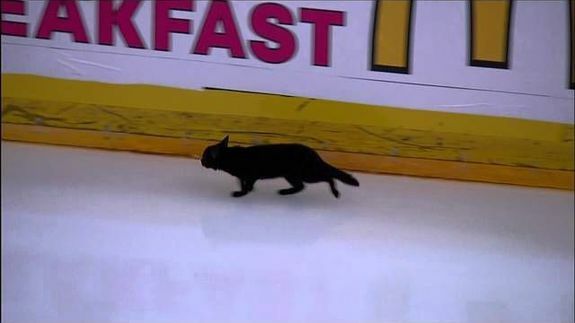 Mysterious black cat trots onto ice during hockey warmup - trendistic.com: ever tried. ever failed. no matter. try again. fail again. fail better. TIL: there might be such a thing as a feline hockey fan. A black cat was seen trotting around the ice before Friday’s matchup between the San Jose Sharks and the Nashville Predators — providing both teams with an excellent excuse for losing. The Sharks, who were on home ice, ended up coming out on top, beating the Predators 5-2. So maybe this is a lucky black cat? All joking aside, black cats aren’t actually unlucky (obviously). In fact, this myth often hurts their chances of finding homes. Adopt one yourself — you could end up with a furry hockey fan like this guy.